Over a hundred NROC Algebra and Developmental Math courses have been added to the NCLOR. The NROC courses utilize various combinations of video, animation, still graphics, simulations, text and audio. Each course includes structured learning guides. This series is available to NCCCS Faculty Only. NROC’s Developmental Math Program is designed to be used with students striving to meet college entrance requirements. The program has pre- and post-assessment features that help direct students to the content needed to close their proficiency gaps, and offers video, audio, interactive simulations, puzzles, and other instructional approaches that engage a variety of learning styles and attitudes. Also included are instructor guides and etextbooks for the courses. Many of the developmental math resources have been tagged to the appropriate DMA 010-080 student learning outcomes. 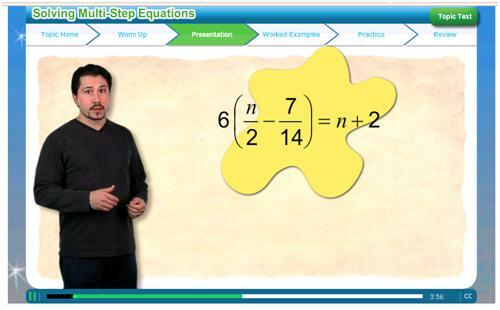 Screenshot from the “Solving Multi-Step Equations” learning object the the NROC series. The resources from this series may be used in the following courses: DMA-010, DMA-020, DMA-030, DMA-040, DMA-050, DMA-060,DMA-070, MAT060, MAT070, and MAT080. To search for these resources by student learning outcome go to Search> Click on “Within”> choose Student Learning Outcomes from the advanced search. click on the NROC series. Posted on September 10, 2012, in Collection Update Posts and tagged Algebra, Math. Bookmark the permalink. Leave a comment.